Payment fraud is a serious issue that should not be taken lightly as not only is it a criminal act, but it can also ruin the lives of its victims. From elderly victims who lose their life savings, to companies who find themselves unable to pay employees, fraud can have sometimes devastating consequences. But fighting fraud and keeping your clients, customers and your company safe from fraudsters requires knowledge of what you are dealing with. What types of fraud do you face? How successful have efforts to tackle fraud been already? And what tangible actions can you carry out in order to avoid and prevent fraudulent activity? New statistics out of the United Kingdom reveal how several countries have been affected by fraud, also helping to shed more light on where and how businesses and customers are being targeted. This information is invaluable when it comes to facing fraud head on. A report published by Financial Fraud Action UK (FFA UK), which uses statistics gathered from its members (these include “major banks, credit, debit and charge card issuers, and card payment acquirers”) states that although there were £1.76 billion of prevented losses in the UK in 2015, the UK also saw £755 million in losses that FFA UK members were unable to prevent. This is “equivalent to £7 in every £10 of attempted fraud being stopped,” explains the organisation. Moreover, the report notes that 75% of fraudulent losses were in payment card fraud, 22% were in remote banking and 3% was with cheque fraud. The total value of losses from fraud is also a 26% increase over the previous year. Breaking down these statistics even more tells us where fraudsters are making gains. For example, not only was payment card fraud the biggest slice of the fraud losses pie, but it’s also where fraudsters made 18% more than they did in the previous year, while the total case volume cases was up by 15%. Remote banking fraud saw even bigger gains as the total loss value is up by 72% and the total case value is up by 53%. In fact, it was just one category of fraud, cheque fraud, which appears to show continued signs of decline (a trend that has been occurring for several years) with total loss value down by 6% and the total case volume also decreasing by 30%. FFA UK’s data also offers some suggestions as to why there were gains and losses in these particular areas. The report notes that overall card spending has grown by 7% between 2014 and 2015, which is huge when you consider other statistics (such as those from this UK Cards Association report) that suggests that card spending already accounted for 32% of the UK’s GDP (gross domestic product), also being described as “critical to the economy”. So, it makes sense that as more people use their cards, more fraudsters are committing payment card fraud to take advantage of the rising number of potential victims. The sharp increase of remote banking fraud, on the other hand, is likely down to the fact that “criminals are also increasingly targeting business and high-net-worth customers,” which also explains why the total value of losses is so high. The report does note that “a total of £524.6 million of attempted remote banking fraud was stopped by bank security systems” and that 40% of losses were successful recovered after the incident, but given that businesses are being seen as major cash cows by fraudsters, this information is no excuse for organisations to take remote banking fraud lightly. Cheque fraud, meanwhile, continued its decline, reaching its “lowest ever annual total” according to the FFA UK. One major factor in this appears to be the bank’s monitoring systems which managed to prevent £392.8 million in losses (“£9.50 in every £10 of attempted cheque fraud being stopped before a loss occurs”). With those figures being great cause for concern, the question you are likely asking is just how exactly are the fraudsters managing to make this much money. Payment Card Fraud: This includes remote purchase fraud (stolen card details used to make purchases online, via telephone or via mail order), lost and stolen fraud (lost and stolen cards used to purchase goods or withdraw money), card not received fraud (the card is stolen when it’s in the mail and on the way to the “genuine cardholder”), counterfeit card fraud (stolen details are used to make a counterfeit card) and card ID theft (stolen card details are used to open or take over an account). Other types of payment card fraud include: face-to-face fraud (fraudsters steal card details for transactions conducted face-to-face in shops), contactless fraud (fraud via contactless cards or mobile devices) and cash machine fraud (card accounts are taken over and used to withdraw money at a cash machine). Remote Banking Fraud: This includes Internet banking fraud (fradulent payments taken from a customer’s bank account, using Internet banking), telephone banking fraud (fraudulent payments taken from a customer’s bank account via telephone banking) and mobile banking (fraudulent payments taken from a customer’s bank account via mobile banking). Cheque Fraud: And finally, cheque fraud includes counterfeit, forged, and “fraudulently altered” cheques. As you can see, there is an incredulous amount of ways in which fraudsters can exploit companies or their customers; but it’s something that you absolutely have to work to prevent. 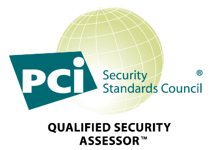 One way of doing this is by becoming PCI compliant, with the PCI DSS (Payment Card Industry Data Security Standards) detailing what businesses that deal with cardholder data must do in order to keep that data safe. Find out more about compliance and how trusted security professionals such as Advantio can help you by clicking the button below.